Sign of the First Advent: "A Virgin Shall Conceive"
Listen to John MacArthur's whole sermon entitled, "Examining the Virgin Birth" here. Only one time in all of the annals of the Word of God is it ever said that a woman had a seed, her seed and that's an indication of something special. Satan is going to be in antipathy against the woman's seed. That which Satan produces will mitigate against the seed and it'll all ultimately of course come to a final battle and it says, "he shall bruise thy head," in other words the seed of the woman will destroy the head of Satan, "and thou shalt bruise his heel." And we know what the story is, on the cross Satan could apply a bruise to Christ but it only bruised His heel where at the same time Christ was dying on the cross He was rendering the crushing blow to the head of Satan. Now we know who the seed of the woman is, it's Jesus Christ. And the very fact that it says "her seed" is a Genesis chapter 3 prophecy of the virgin birth of Jesus Christ. A woman doesn't have a seed, but here is God the Holy Spirit laying out the foundation of the virgin birth in the third chapter of Genesis, the only time in history the seed was ever in the woman. And always from here on out it is always spoken of as his seed, his seed whenever progeny is spoken of, whenever somebody's family is spoken of never her seed, that's the only place it ever happens in the whole Bible. "Therefore the Lord himself shall give you a sign;"
Now a sign is something that points to somewhere, a sign is something to get your attention, to show you something greater. You see a sign that says Los Angeles and you know you're coming to the place, the place is always greater than the sign, there's always something beyond what the sign is and yet the sign must be unique, it must be very easily identifiable. If you were driving somewhere and all you saw was a sign that said: 'City Limits', it wouldn't help you much if you didn't know what city. When God gives signs they are very specific, very particular, and we find that here, so there's a sign, what is the sign? 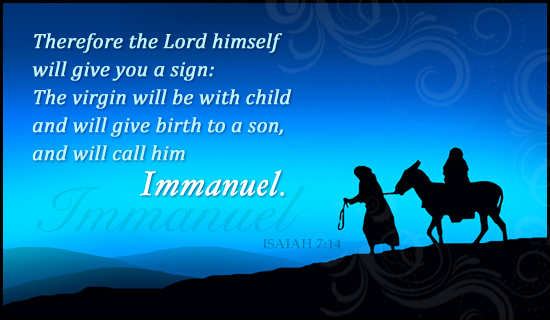 "The virgin shall conceive, and bear a son, and shall call his name Immanuel." Now listen, some people say the word almah just means a young girl, the liberals say it's just a young girl, a young girl will conceive and have a son and name him Immanuel. For all we know it could be the mother of Immanuel Kant or Immanuel Escobeido or anybody else. People say, "and it's just a young woman who's conceiving and bearing a son". Listen beloved, if this is just a lady having a baby that's no sign, lots of ladies have lots of babies, and lots of them have named them Immanuel, that doesn't prove anything, what kind of a sign is that? You can't take the word almah here and make it mean anything but virgin. The world almah only appears nine times in the Old Testament and eight times of its nine appearances it must demand pure virginity. The translation is right, the virgin shall conceive, and I want you to know virgins don't conceive. And watch this one, further a virgin shall bear a son. Now I want to tell you something very interesting, you notice what it says here, "the virgin shall conceive," that's not a verb, that's an adjective. It literally translates "the pregnant virgin shall bear a son." Now people have said, "well okay we'll allow the word virgin, the virgin conceived but at that point she stopped being a virgin". That isn't what the verse says. The already pregnant virgin bears a son, do you see the point? A virgin bearing a son? Impossible, that's the sign. When you see a virgin bear a son then you have met her seed and then his head is about to be bruised and His name shall be called Immanuel which the New Testament says means "God with us". That's the sign, that's the sign.